I haven't had the new additions in my wardrobe long, but I wanted to give them a good test run to see how I will wear them and decide if they were worth what I think they are. Monday I wore a skirt because it was up in the 40s. I didn't go outside a lot I just wanted to wear it. I wore my fleece lined leggings underneath. They are grey but I have no picture of them. Tuesday it got a little chilly again. I wore a fancy looking bright lilac, long johns material ,top. The lace stuck out from under the pink sweatshirt material top. Jeans and my snow boots kept me toasty warm. Wednesday I wore my jeans again. 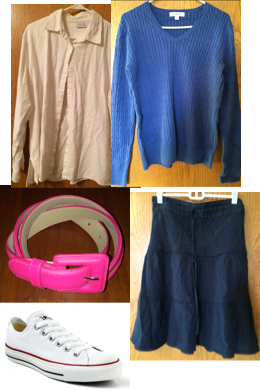 (I actually have 2 pair, but the picture shows the same pair) with a lilac linen shirt and my favorite sweater. It has every color imaginable in it. It's like my technicolor sweater. I wore my hiking boots since the snow wasn't very high. Thursday I wanted to wear some more of my new things. I had washed them all and this one was looking dapper today. It's a navy and pink cotton shirt. I paired it with my thinner pink sweater and jeans, yes again! Sunday it was warmer and I wanted to dress it up a little bit after wearing sweats for 2 days. So I chose my raspberry dress with my new floral shirt and tan tights. Snuggly boots and a bright yellow sweater to finish me off. These boots were given to me by a friend and they are really warm. I love the toggles on the sides too. I know I talked about how I fell off the bandwagon with Project 333 for Jan-March. But I did really good until I added new things. I had to test them out and most of them got to stay. The pink and Navy plaid did not stay. I ended up hating that ruffle on the front. If it wasn't there, I would love it. And if I took it off it would look weird. Otherwise I love the color. I'm hoping that the next season will be easier for me. Winter is just hard to do for me since it's my first one. 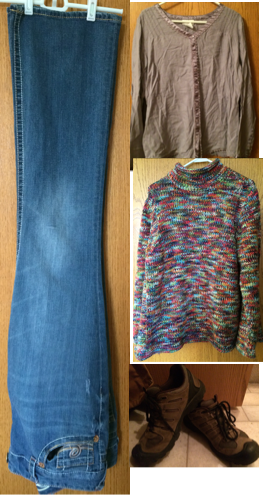 I did OK when the weather was balmy, but when it got cold I brought in more clothing. Bad me! Oh, well. I have to stay warm. I'll try again with the next season, which is April-June. Don't give up on me. Also, if you are struggling know that you are not the only one. I too, dear reader, still have a lusting eye for new clothing.